or is it the pharma talking? Nat’s mom and dad – former environmental activists – could have waited just a few more years to invoke the Service Contract ending their lives, till the teen and her younger brother moved out as workers – why now? In this too-possible dystopia, global warming has changed weather patterns, babies are now illegal, and new diseases mutating weekly make face-to-face contact rare. Book info: Pills and Starships / Lydia Millet. Black Sheep/Akashic Books, 2014. [author site] [publisher site] [author interview on NPR] Review copy and cover image courtesy of the publisher. My book talk: Preparing to honor her parents’ final week of life, Nat learns that big money uses pharma to trick the few remaining Americans into thinking that global warming has eliminated the entire natural world. At a tropical resort devoted to final Contracts, the teen and her hackerkid brother discover real plants and animals and people who think for themselves. Are pharma-corporations really lying to the public about imminent doomsday? Her decision about joining the rebels must come soon, as her parents’ date with a lethal farewell drink in mere days will leave Nat and Sam in a group survivors’ home in Oregon – are her parents really sad enough about the state of the world to leave it forever? When a mega-hurricane hurtles toward Hawai’i, will it be too late to rescue her not-old parents and not-old-enough brother? Young people must prevail or die. The final volume in the Ashfall Trilogy is a blockbuster! Alex and Darla have survived cannibals, bandits, the US government, and near-starvation in Ashfall (my review here) and Ashen Winter (my review here). Now they must organize citizens against an oncoming threat or decide to leave the townspeople to their own fate… what a burden for kids just old enough to drive. Full disclosure: I’ve been eagerly awaiting this book since I won the right to name a character in it through the Authors for Henryville auction which raised money to rebuild school libraries after the 2012 tornado there. The character who shares my husband’s name in Sunrise is somewhat like him (not always the case where naming rights are involved – thank you, Mike); no spoiler to tell you that he dies, because many, many people die in the perpetual winter brought on by the Yellowstone supervolcano eruption, so I’m tangentially in the book as his widow. I just discovered Darla’s Story eBook, told from her point of view, paralleling Alex’s narrative in Ashfall from the supervolcano eruption to their meeting on her Iowa farm under perilous circumstances (makes this a trilogy with 3.5 books). How well would you survive a frozen future? 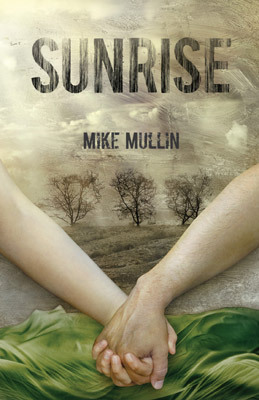 Book info: Sunrise (Ashfall Trilogy, book 3) / Mike Mullin. Tanglewood Press, 2014. [author site] [publisher site] Review copy and cover image courtesy of the publisher. My book talk: After a year of perpetual winter, Alex and Darla face tough choices when his uncle’s farm suddenly fills with townspeople who think the armed bandit attack is a one-time problem. Everyone is tired of subsisting on kale and frozen pork, but when refugees flood Uncle Paul’s Illinois farm after renegades attack the nearby town, it’s up to young people like Alex and Darla to find medical supplies and more food (and maybe retaliate against the aggressors). When folks move back to town but refuse to post guards against the bloodthirsty psychopath’s brigands, Alex and Darla lead another group to establish a safer settlement, complete with greenhouses and electricity from a repurposed wind turbine. Why is Mom staying in town instead of with Alex? Why won’t the Mayor post guards against the next attack? Will Alex and Darla stay alive long enough to make their love a true commitment? The Prime Minister controls everything – and everyone – else. Underground for so many generations, the humans guarding Earth’s last freshwater source have mutated into Rat-like darkness dwellers… that’s what the Council tells the Toppers in 2250, when rain on the Earth’s surface is only a memory and emotions are deemed unnecessary. Imagine having to memorize each step and turn of the long, perilous journey to the Aquifer! If Luca’s father, the Deliverer, is brave enough to face the Rats at the Aquifer every year to renew the water agreement, why is he so sad and distant the rest of the year? Be sure to have a big drink of cool, clear, fresh water at hand when you read this intriguing tale of a future Australia and a young man whose emotions refuse to stay sedated – just published this month. 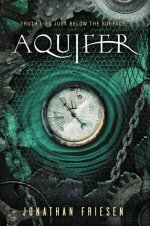 Book info: Aquifer / Jonathan Friesen. Zondervan, 2013. [author site] [publisher site] [book trailer] Review copy and cover image courtesy of the publisher. My book talk: Luca knows someday he will be Deliverer, making the dangerous journey underground to ensure New Pert’s freshwater supply, but all the Toppers believe about the Rats controlling the Aquifer in 2250 may be a lie. Only needful work is allowed, no wasteful emotions or art or writing, say the Prime Minister and the Council, so the precious water lasts all year, until the Deliverer renews the agreement with the dreadful Rats by taking them lightsticks that only the Toppers can make. At 15, Luca is nearly done with school, trying to train his mind to remain calm, practicing the memorized steps and turns of the journey to the Aquifer that his father teaches him, the dreadful journey that someday will be his to make as Deliverer. Trying to stay unnoticed by the Watchful Amongus is essential, else the Council’s enforcers will cast offenders in chains and dump them into the sea – “undone” from this life. When Luca hides a classmate who’s declared undone in the Deliverer’s shack, he starts a chain of events that could undo the cautious agreement between the Rats and the Toppers, breaking off the water supply or opening it forever. Why does the museum-keeper show Luca the things she calls “books” and teach him to write? What broke the spirit of the Deliverer – his many journeys to the Aquifer or something else? When the time comes, will Luca be brave enough to travel underground as Deliverer? The forest cats did what they could. Is it so wrong to wish death away? Trying to follow the instructions of Old Mother Possum, meeting up with the Bear People, Lillian only wants to make things right, even if she cannot undo everything that the cats’ magic set in motion. An excerpt posted by Tor here gives you the flavor of Lillian’s story in this lyrical tale, much expanded from De Lint’s 2003 “Circle of Cats” 44-page novella also featuring illustrations by Vess. This most-magical book is being released tomorrow (March 5, 2013), so ask for it at your local library or independent bookstore. Indeed, is it so wrong to wish death away? Book info: The Cats of Tanglewood Forest / Charles De Lint; illustrated by Charles Vess. Little Brown, 2013. [author’s website] [publisher site] [illustrator’s website] Review copy and cover image courtesy of the publisher. My Book Talk: It was the cats who decided to save Lillian. She just wanted to say hello to the fairies, but here she lies, dying of snakebite. Changed by their magic from a dying girl into a live kitten, Lillian can’t comfort her aunt or the neighbors who search the old woods. She must find out how to turn back into herself… and then how to make right the consequences of her choice. These forest cats know that their magic might anger the Father of All Cats, that great black puma who stalks these ancient woods, who prowls in dark dreams. But they just couldn’t let the girl die, not after she’s been so generous with milk for them and respectful of the Apple Tree Man. Lillian-kitten sets out to find Old Mother Possum, who might help her turn back into girl-Lillian. Accompanied by T.H. Fox (his mother named him Truthful and Handsome), she makes the long journey, despite his warnings that the part-witch-part-someone may not choose a solution that’s easy or simple. Oh, turning back one death puts it onto another! Now Lillian has a bigger problem to solve and consults the wise woman at the Kickaha reservation nearby. Aunt Nancy sees only one path and not an easy one, as this problem is so big that Lillian must ask a difficult favor of the fearsome Bear People, no matter what the personal cost. Does young Lillian have the courage to walk alone into the Bears’ den? Why do the cats of the forest keep watching her? Is love enough to turn away death? A brain for numbers that never, ever stops. A hunger to have a normal senior year. And now Farrah goes from understated jeans to completely undercover as the FBI realizes that her OCD about numbers and patterns is their best bet for catching an ecoterrorist whose been sending others out to do his dirty work for years. Grab Digit’s first adventure now in hardcover or eBook at your local library or independent bookstore (it won’t be out in paperback with the much-better cover until late May 2013) then hang on for Digit’s first year at college when Double Digit is published in January 2014! Which of life’s codes would you be most anxious to crack? Numbers pop up on television when they shouldn’t be there, but the station says she’s imagining them. Her genius skills crack the code, pointing to a terror attack at JFK Airport, but her report to the FBI is ignored…until it happens. Now a ruthless band of ecoterrorists is gunning for Digit, so she has to fake being kidnapped and go undercover to help the FBI break the rest of the code to prevent more attacks and catch the terrorists. Nice to really be appreciated for her skills, even nicer to be undercover with cute young FBI agent John as they race to interpret more clues. But somehow, the bad guys find one of the safe houses, John and Digit have to go into deep cover without contacting anyone, and the stakes in this math puzzle get deadly in a hurry. How fast can they unravel the last parts of this puzzle? What will the ecoterrorists’ next move be? Will Digit’s “kidnapping” have an unhappy ending? (One of 6,000 books recommended on www.abookandahug.com) Review copy and cover image courtesy of the publisher.